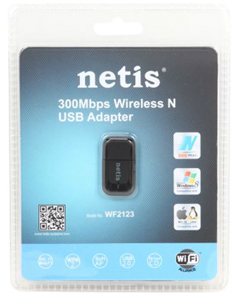 Netis WF2123 N300 Wireless Mini USB Adapter is designed to connect to either a laptop or desktop computer to access your high speed Internet connection. Its small design is convenient that can be left inside your computer whether traveling or staying at home. By clicking on the WPS Button you will be connected to your network within seconds. The WF2123 can provide wireless Internet connection to other wireless devices without having to buy an additional Access Point with its Soft AP Mode. MIMO antenna technology ensures a maximum wireless range by allowing you to enjoy the wireless freedom around your home. It is compatible with Windows Operating Systems. MAC Operating Systems and LINUX. The Netis device gives you a wireless high speed up to 150Mbps. Three times the speed and twice the range of 11G devices, at an affordable price. The Netis Adapter can act as an Access Point by providing a wireless signal to other wireless devices without having to buy an additional Access Point. The Netis device supports Windows 8. The Netis Adapter supports Mac OS. The Netis Adapter supports Linux. Dimensions 2.36" x 0.98" x 0.35"